WOKING commuters will be relieved to hear that South West Trains are introducing more than 1,300 additional seats to their morning services into London over the next 18 months. Overcrowded and heavily delayed trains did not make a positive start to the New Year for those using one of the UK’s busiest routes. Last year the 7.32am commute from Woking to London Waterloo was among the most crowded in the country, with a 154 per cent load factor reported. Woking MP Jonathan Lord said: “I know from my postbag – and from travelling on the trains myself – the strength of feeling on the issue of overcrowded peak services. “For the past four years I have been lobbying the South West Trains and Network Rail Alliance, as well as the Department for Transport, to greatly increase capacity from Woking, which features regularly in the top 10 most overcrowded train services. And in September the Minister called on train operators to act immediately to find new ways to create space on the network and in their trains. That month she also announced a £210 million deal for a fleet of new trains on the busiest commuter routes. South West Trains are now introducing a total of 1,361 additional seats on the Woking to London route: 821 extra on trains leaving between 6.47am and 9am; 334 more on the 9.13am service; and another 206 on the 9.22am train. 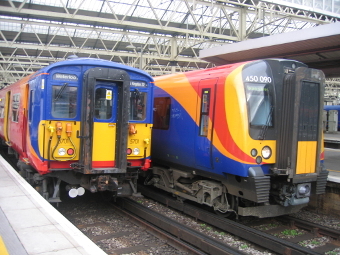 Further increases are planned between 2017 and 2018 when the operators will introduce 30 new five-carriage trains to the network during peak service times. However, it could be a case of too little too late to accommodate the borough’s regeneration. It is estimated that demand on our rail services will rise by 40 per cent over the next 30 years, and Mr Lord has called for more drastic measures for our over-burdened commuters. He said: “It is essential more radical new options are introduced to provide the capacity we so desperately need on Woking’s trains. Woking is a central hub where a majority of trains converge before branching out to other destinations. The stretch from Basingstoke to London Waterloo via Woking is being considered for double-decker trains, so any new service that comes through the town is likely to improve capacity. Mr Lord added: “Other long-term ideas include a flyover or tunnel at the station to accommodate additional services. “I would urge everyone who travels by train to respond to the consultation before it closes on February 18. The final decisions will be made next year by the Secretary of State, and I will be pressing the Minister for Transport over the coming months for radical and robust solutions for Woking to get the go-ahead. FIND the consultation online at www.networkrail.co.uk or email wessexroutestudy@networkrail.co.uk to submit your views directly.